Todor Imreorov (blurymind) updated subscribers of T43933: Graph Editor: (Auto-)Focusing Channels. Todor Imreorov (blurymind) added a comment to T43933: Graph Editor: (Auto-)Focusing Channels. I dont think its simply a user interface change proposal feature. It is a workflow automation feature that other software already has had for years - leading blender in the animation department. Do you guys think the toggles should be in the menu, or should they be in the form of buttons? Ah I see, sorry I misunderstood it. what is more important - fast workflow or design consistency? Todor Imreorov (blurymind) added a comment to T40441: Hair particles are not rendered when in particle edit mode. i wish we could at least see it in the viewport. Todor Imreorov (blurymind) added a comment to T40107: painting on a psd image crashes blender. do you open and save it in gimp? It no longer crashes blender in the newer krita, however the file imports with the wrong colors! Todor Imreorov (blurymind) added a comment to D24: Blender Internal: Add "Lamp Data" shader node that allows shaders to acquire information such as light vector from specified Lamp..
Todor Imreorov (blurymind) added a comment to T44283: Region overlap does not work on linux anymore. Setting it to "Triple buffer" made region overlap work again! Todor Imreorov (blurymind) created T44283: Region overlap does not work on linux anymore. if it poses any serious complications to implement as two separate toggle features, I propose to have these two as a single feature - the way it was in the original patch. They seem to work well hand in hand and I would personally love to have them both on all the time. I think we've come to a agreement for a design. What's left now is to test it out in another patch+test build. Also we need to consider what to do when you want to skip selection in this solo visibility mode. Yes, without actually selecting the channels. I am ok to have it - as Cessen suggested above - it seems more consistent that way too. From this comment, bassamk wanted the options to be more visible, easier to switch. From this comment Severin proposed adding the options to the View Properties panel of the properties region. Another way could be to add two icon options to the header region, something like this picture. I am OK with that. For as long as the functionality works automatically as an operation mode that can be kept switched on/off, it doesn't matter that much where those switches are - be it two visible button toggles or two new entries in the view menu. well so far we have two ex Maya, now blender animators (me and Fahr) trying to convince two Blender developer/animators (Cessen and bassamk) that if the feature is not implemented as a workflow mode, it will loose a lot of it's convenience and usability. It seems like the argument is mostly on the "hide unselected channels" part of the feature and how that is being triggered. Todor Imreorov (blurymind) added a comment to D1128: Graph Editor: "Auto-Focus Channels". I agree with Fahr. It's exactly why I prefer working with that feature on. Todor Imreorov (blurymind) added a comment to rB030b0aab430d: Outliner: Added new mode for displaying "orphaned" datablocks. Please remove the error prone stupid default behavior of purging all the other animation Actions that are not assigned to the armature when you close the application. Add the option to give them a fake user automatically by default. Auto frame in maya does not hide the curves.It only frames them. every click you make, every button you press is multiplied by the number of times you switch to a new channel. It all adds up. This feature is here to completely remove the need for extra clicks and button presses for the user when switched on. It can be a tick box somewhere in the graph editor interface (mockup needed) if you dont like the view menu. I am not against your proposal of the placement. I partially agree with you - it wont be found initially by new users. But that is normal with any other software. You seem to also have a personal preference of disliking that menu and wanting some things moved out of it - to another place. I agree with fahr that bassamk's suggestions sound way to convoluted/unclear. Todor Imreorov (blurymind) added a comment to T43430: Action editor - saving (animation) actions is error prone and counter intuitive- DATA LOSS is too likely!. Now that there is a patch to easily do it with the outliner, I think it should be done manually by the user instead of by blender without a warning and no ability to undo. Be it manual or optional, default or not - It would stop this madness of people losing their work. Oh I also forgot to ask. It's not showing it in the gif file. Does it also work on multiple selected channels? would it be possible to get a Linux64 or windows64 build to test on? Todor Imreorov (blurymind) added a comment to T43640: Modifier: Normal Edit - needs documenting. apologies. I didnt know. You guys are absolutely awesome!!! The official effort by the blender foundation for a normal edit modifier is not very useful and is very limited since you can only direct the normals of a mesh towards another object's position in space. Now thinking about it, I think part of the problem is that blender's action editor successfully misleads the user to the idea that an armature can be the owner of multiple actions. And that the drop down list is not there to select which one is being owned by the armature- but more like a way to switch between them and work on multiple actions simultaneously - similar to the way you switch between editing modes in the 3d viewport. That is what an animator would use it for in most cases in my opinion. It's just also very unexpected that blender would delete all of the other ones in the list if they dont have a fake user. Another way to suggest to the user that their Action editor data is not going to be saved (when the "F" button is not toggled) - is to append an asterisk (*) symbol to the end of its name. Thats why I first posted at blender artist, to collect data from other users. Surprise surprise, there are others who lost data just like me. I've been using it for more than 3 years btw. This has happened to me twice. Would I have taken the time to write this bug report and invest time in arguing on why its a bad design if I didnt get personally affected by it? I am not requesting change in the underlying structure. Yes there will always be users who are disrespectful to other users. Internet is like the wild west. However in this case, I presented you with a number of logical arguments to correct a design issue. Some of the users at BA are actual developers , who also support the idea that this is currently an issue. if it has consistently led to data loss, to many users - as confirmed by people at blenderartist, then yes- it has to change somehow. In way in which everyone is happy. only that blender has no trash can. It deletes the file without a warning and you can not get it back. Do you have to mark it with an f button in order to tell the operating system not to delete the file when you close the file manager? Todor Imreorov (blurymind) added a comment to rBdffdde4cdce3: Graph Editor: Auto View. I hope I didnt cause too much trouble. This is really a big time saver when you animate. On the issue of interface clutter: if you implement it in the way I suggested, the user will not have to constantly switch it on and off. It can just stay on. when you select one or more of the channels (show and frame only the curve(s) of the selected channel(s)). Some developers and users complain that having to close blender and reopen it to clean up datablocks is counter-intuitive and causes issues. will you consider implementing it the way we suggested it at blenderartist? The feature is called "Auto frame" in Maya and other software. What it does is similar to this, but without the need to select keyframes. The keyframe selection mode is somewhat cool and I would love to experiment with it for a while to see how useful it is, but it still requires more repetitive work when you compare it to what I had in mind. Yes I agree that would be even better, as confirmation dialogues before closing the software tend to be annoying sometimes. If you want blender to be widely adopted, you have to have some common sense. I understand that there will always be people who get used to something and tend to protect it no matter what. Can't you see that this is an intrerface/design issue. Blender has absolutely no warning when deleting user data. and it can not be undone. It does it by default, if you dont click on an obscure little icon every time you create new actions. Why cant we just keep that icon ticked by default? Or at least have the option to do so. Why are developers so against it. At least issue a warning when you close the blender scene. Todor Imreorov (blurymind) added a comment to T43369: (global) Undo on an armature kicks me out of Pose mode . Loading factory settings and using the 2.73a build seems to have fixed the issue. Mark as solved. well, the first you can do is communicate/warn the user that data is under the danger of being wiped. The "F" button is too easy to overlook. So underlining the text with red when it has no fake user would be a nice temporary semi-solution. When an F-curve is dead for example- blender puts a red line under it's name. Blender's design put our team in a lot of trouble near the deadline. Todor Imreorov (blurymind) created T43430: Action editor - saving (animation) actions is error prone and counter intuitive- DATA LOSS is too likely!. Yeah, I have the defaults atm.Global undo is ticked and Steps is set to 32, memory limit = 0. It still kicks me out of pose mode when i undo. Todor Imreorov (blurymind) created T43369: (global) Undo on an armature kicks me out of Pose mode . Todor Imreorov (blurymind) added a comment to T42339: Design: Sticky Keys (+ Integration Into Pies). Todor Imreorov (blurymind) added a comment to T43031: vertex group list doesnt update on all clones - vertex groups are shared, but vertex group names do not get updated on all instances . Todor Imreorov (blurymind) created T43031: vertex group list doesnt update on all clones - vertex groups are shared, but vertex group names do not get updated on all instances . Todor Imreorov (blurymind) added a comment to T41268: Mesh geometry can not be edited - cant move vertices. i appended his hands and feet from other (older) models (i had) who had shape keys on them. I duplicated a part of the mesh (hands and feet) , separated it, cleared the shape keys and then appended it to use on the kid. Todor Imreorov (blurymind) created T41268: Mesh geometry can not be edited - cant move vertices. Todor Imreorov (blurymind) added a comment to T38490: Tabs Visual Design. I kind of like Seba's tab design proposal, since it removes the slightly ugly gap between the tabs. It's how Unity does tabs. Todor Imreorov (blurymind) added a comment to T39835: "Topbar" Tabs. Todor Imreorov (blurymind) added a comment to T40153: Disable Auto-perspective (by default). I am glad that you have taken actions to address the issue. It would be great if auto-perspective supported alt-snapping one day though. After finding out the idea behind auto-perspective I have to say that it can potentially be super useful to me if it did support my preference to the alt key instead of the numpad buttons. Todor Imreorov (blurymind) added a comment to T40148: Alt+snapping to Front/Back/Side/etc views with autoperspective on doesn't switch the view to Ortographic. Todor Imreorov (blurymind) raised the priority of T40148: Alt+snapping to Front/Back/Side/etc views with autoperspective on doesn't switch the view to Ortographic from to Needs Triage by Developer. Hi, heres the file after being saved in gimp. opening it in gimp, i get a warning message about an embeded color profile (invalid- utf8 string). It asks me if I want to convert it to rgb working space. Todor Imreorov (blurymind) raised the priority of T40107: painting on a psd image crashes blender from to Needs Triage by Developer. Will you keep the blender version/scene information bar in the panel though? It is quite wide. 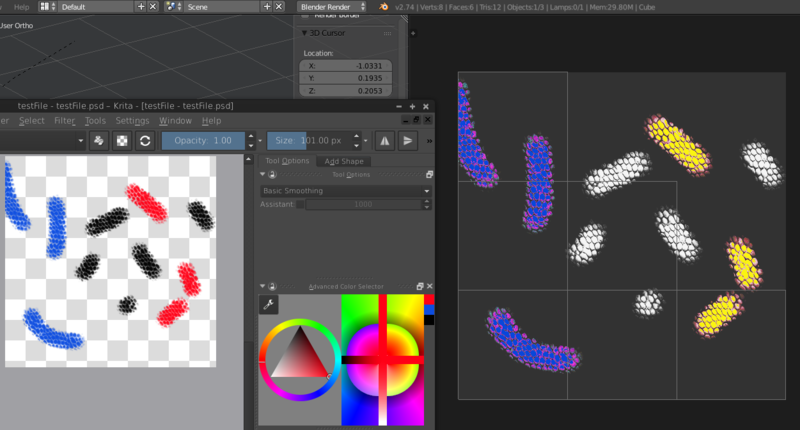 Todor Imreorov (blurymind) added a comment to T39752: vertex painting with a mouse doesnt work at all. hi, thank you for confirming this. Disabling vbo fixes the issue!! it does it on the default cube as well. I think this is an issue with radeon's open source driver under linux. Its not even doing it consistently. did you try painting on it with a brush? I would like to add that this worked just fine in 2.69. Todor Imreorov (blurymind) raised the priority of T39752: vertex painting with a mouse doesnt work at all from to Needs Triage by Developer. Todor Imreorov (blurymind) added a comment to T39183: Auto-perspective changing to perspective while orbiting - bug is back. I am sorry. Didnt realize it was a feature and the sudden new behavior seemed like a bug to me. Yes, I would always expect blender to remember my viewing mode and only change it on request! I have uploaded a video demonstrating the bug with the latest build. Todor Imreorov (blurymind) raised the priority of T39183: Auto-perspective changing to perspective while orbiting - bug is back from to Needs Triage by Developer. Todor Imreorov (blurymind) added a comment to T38346: Add Tabs to 3D View Paint Modes. I agree with XRG and Psy-fi that topology should not be in the brush settings tab. I brought this up at blender artist and some people argued that they need to keep it there so it is always visible - not to need to switch between tabs. Todor Imreorov (blurymind) added a comment to T37601: Implement Vertical Tabs for Toolbars and other regions. There was a suggestion to color code the tabs at blender artist, which I thought is quite interesting way to help users find things by colour. I think softimage did something in those lines - although not for tabs. Perhaps to be more subtle, you could only color the text in the tabs. Or use a small circle icon next to each tabs name (like a dot) with a different color based on the tab.